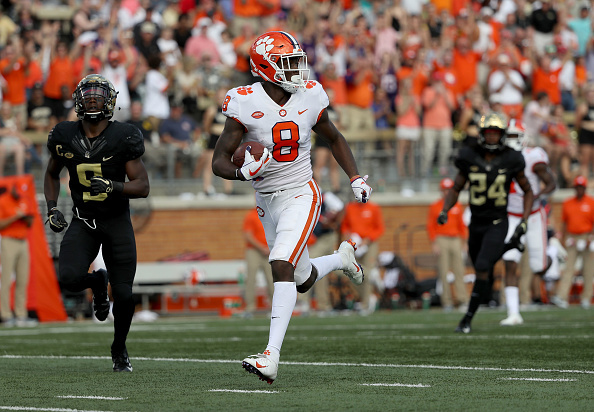 For the Clemson Tigers, there are very few roadblocks between now and a possible fourth straight appearance in the College Football Playoff. Saturday was an absolute walk in the park in Winston-Salem, N.C for Clemson. For Wake Forest, the 63-3 throttling is the worst home loss in school history. Other than the fact that it was a beautiful day outside, there was absolutely nothing enjoyable for fans of the Demon Deacons to experience. The challenge for Clemson may be finding a way to stay motivated for the remaining stretch of regular season games. But Clemson’s defensive coordinator Brent Venables is not anticipating any challenges in keeping his unit focused. Tigers head coach Dabo Swinney was equally impressed with both sides of the ball. If you thought Clemson couldn’t be any more loaded in the backfield, another star emerged today in Winston-Salem in the form of Lyn-J Dixon. Normally averaging 16.3 yards rushing is good enough to lead your team and possibly the nation on any given Saturday. However, Travis Etienne’s 167 yards on 10 carries led the way. For Dixon, 163 on the ground and another 41 receiving certainly announced his presence loudly and to thunderous applause from traveling fans. It was the first time since 2006 that Clemson had three running backs rush for more than 100 yards in a game. After a bye week, Clemson hosts undefeated NC State on Oct. 20 and in a matchup worthy of primetime consideration.